My husband's grandmother was quite the quilter. I remember when we were dating I would often hear of her going over to the church to sit around the quilt frame and stitch with the other ladies. When we married, she gave us this quilt. I pulled it out this week and placed it on my bed. When I see it, I think of her and it makes me smile. I loved spending time with her. Her name was Leokadie and saying her name was like poetry to me. She was loving and kind and gentle. There wasn't a craft that her hands could not do. She made the best Pierogi I have ever eaten and had the whitest hair I've ever seen. During our visits to see her in her last year with us, she was never without an open Bible by her side. Inside her Bible was a crocheted cross and I would see her touch that ever so gently with her long fingers. She made quilts for all her grandchildren's marriages. Long after she was with the Lord, her quilts were still being unwrapped as wedding gifts. I am reminded that a piece of her stays with me as I enjoy the simple pleasure of my quilt. For more Simple Pleasures visit Dayle at A Collection of This and That. What fond memories...I have many memories of my grandma which fill my heart with joy as well. Such a sweet post. Treasured memories. Beautiful quilt and memories of a loving lady:>) My mother in law made us a quilt from that same pattern for our wedding. I want quilts that I make to be as treasured as these loving gifts! what a wonderful tribute to your husband's grandma. It sounds like she was rooted in was was important. I love that quilt. I have one in the same pattern but different colors that my grandmother made. It's a treasure for sure. Have a wonderful end to your week. 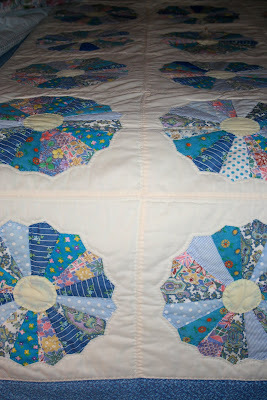 I have some treasures of my Grandmothers and one is a quilt as well. I do think of her whenever I see it. What a beautiful quilt she made. Aaaahhh...What a wonderful memory! What a tribute to a wonderful grandmother! What a wonderful story. I'm a quilt lover myself. They were such staples in the old days and add such a touch of nostalgia today. Thanks for linking back to the party. I'll attempt to add you in the line-up now that Linky is up. I, too, am a quilt lover. Even more, I'm a lover of all things old and precious like grandmothers. There is a goodness in the picture that you drew of her that came through your words. Most blessed are we to have these kinds of ladies in our lives. I want to be MUCH more like them in their sweet simplicity. So glad Dayle had this party so that I could share this. Your grandmother was very talented and I love how she gave something of herself to all her childen and grandchildren...I have just learned how to quilt and it takes time and patience which she must have had in abundance! Thanks for sharing. That's lovely. The idea that her grandchildren receive such a special wedding gift long after she has gone is so touching to me. Just lovely. What a sweet, sweet post. My mother is a quilt maker, and they bring us both joy. Really special memory, and beautiful quilt! What a beautiful quilt and shared story! My husband's grandmother was one of the sweetest ladies I have ever known. She showed me (and everyone she knew) a true love for our Lord. An inspiring role model for all of us! I love quilts and the one you have is beautiful. My grandmother also crocheted - I have a bedspread that she made as well as a tablecloths and a lot of doiles. Oh Renee ... this post is so very moving. My grandmother made quilts, too ... and often gathered with her church friends to work on one together. It's so heartwarming to remember that. And even more beautiful than the quilting part of your story is the picture in my mind of your grandmother sitting with her Bible, soaking in the Word, and gently caressing that cross. I truly am so touched by your words and your pictures this morning. Thank you for sharing such a wonderful post. How precious...my grandmother taught me how to hand quilt and then made me a quilt for my graduation out of all the material I had made my clothes from...she is now 94! What a blessing you have!